It's been awhile. More than awhile - about two and a half years since I've blogged. Why come back? I got an email today saying that my blogger "legacy" account need to be switched or lose it. I've toyed with the idea of blogging again - often I write posts in my head and think about writing but then I don't follow through. Sigh. Perhaps I can try a bit harder :) So. What's happened since 2010 (really longer than that for a real post). Well, both kids have graduated college, both work full time. (hurrah!) Sara got married to John last summer, so I should revisit that in the next few weeks. Our garden has grown, and yes I still am voraciously knitting. The goals for this year are to knit one sweater per month in addition to a pair of socks each month. So far so good. I also have started weaving, as in I wove one scarf so far. More will be happening, but the whole sweater/sock thing takes up quite a bit of time. Enough for now - just this little bit is reminding me though that I really did enjoy the blogging process. I hope to be back soon! Tossing a few words into the vast emptiness.....I don't think I'm totally done with blogging yet, it just seems that way! I'm in the process of trying to switch over to wordpress, so find me there at thatsmymiddlename.wordpress.com. Hope to see you soon - and I'll try to get some posts out of my head! Most likely everyone has used that as a blog title at some point, no? So here I am, one year older, and quite awhile since a post. Oh well. What have I been up to? Knitting, regular everyday stuff and more knitting. I knit Patrick a modified Pub Crawler sweater for Christmas out of Black Water Abbey Yarn, color Jacob. I think this was a record for me - 6 days. Yes, I cruised on it, but it needed to get done. He's cold at school. We celebrated Sara's graduation from the University of Washington (BA English Lit, BS Molecular Biology) Here's a picture of her heading over to campus with her last undergrad paper. 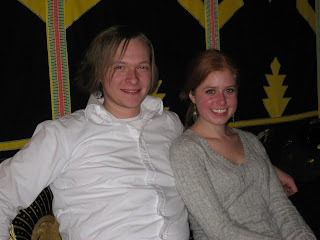 Later we took her and the boyfriend to a Moroccan restaurant for dinner. Christmas happened, we had too much snow, more unexpected snow. You know the drill. For Christmas I ended up knitting nine of brooklyntweed's turn a square hats. One for each of my nephews on Doug's side of the family and one for Sara's boyfriend. I also knit a new pair of socks for everyone in our immediate family (Doug, Sara, Patrick) and decided to also knit a pair for Sara's BF. The socks came first for him, the hat was extra so that I wouldn't have the leftover yarn sitting around. May as well knit another hat! My last few posts had some content about emergency preparedness. Does anyone care? I wasn't getting any feedback on it, so I thought everyone may have been irritated (non knitting content and all) and I stopped. Okay, enough for now. We are going to go eat Indian food tonight, then maybe a bit of MarioKart or RockBand on the Wii at home after? We'll see! Last Thursday, I started posting a once a week guide to disaster preparedness. This weeks list comes from the hardware store. So, in reality where does one keep all this stuff? I figure if there's an earthquake (our most likely disaster here in the PNW) I need to be able to get to the stuff I've stored. We have some built in cabinets in our basement that we used to use for toy storage. We've managed to clear out a good portion of these, so it made a great solution for me to have an emergency pantry of sorts. The cabinets latch, so I would just have to be able to get to the basement. Doug has a lot of tools, so pretty much anything like rope, duct tape, etc. is here and in good supply. I do always keep a flashlight next to the bed, because you just never know when the power may go out! On the knitting front, I did post last night (Wed 11/12) that I finished the Tilia sweater. I forgot to take pictures today, due to massive raking of leaves and Madrona registration. Tomorrow? I did finish the first of another pair of Christmas socks too. Ahh, Madrona. Well, I did get into the two classes that I wanted (I did ideally want others, but just too much money) Judith McKenzie McCuin Dyeing for Socks on Friday morning, and Stephanie Pearl-McPhee's Speed Knitting Saturday pm. That will give me time to be able to visit with friends too. I'm really not sure why the registration opened up at least 2 hours before the scheduled time...perhaps the company used (in Colorado) forgot to set it for Pacific Time? I was happy that someone on a list I'm on sent out a quick message and just happened to see it come across. Regardless, I think everyone will have a great time. I just finished seaming the last seam on my Tilia sweater - hopefully if the rain slows enough, I'll have some pictures tomorrow! Doug and I (and my brother, Dave) headed over the mountains to Pullman to visit the boys this past weekend. My nephew also attends WSU, (he's a year older than Patrick) thus, the reason my brother went along. It was Dad's weekend and while there were some planned "activities", we chose not to participate and do our own thing. We played some video games, watched a movie, went out to eat, played cards and just chatted. We also went to the football game. Now for some reason, the big three football teams (Seahawks, UW Huskies and WSU Cougars) are having terrible, terrible years. So although the Cougs lost yet again, at least they scored 4 touchdowns this game. All in all, we had a really nice visit, and we are looking forward to having Patrick home for a week at Thankgiving. Since it is a 5 hour drive to Pullman, I did get a lot of knitting done on the Tilia Sweater. Below is how things looked on Thursday morning (back done, front lace section started): and this is where I am tonight. Just the sleeve caps to go and I'll be seaming. Most likely this will be done tomorrow and I'll continue on with some Christmas knitting. I think between the two photos, the bottom one is more true to color. I ended up plying this as a 3-ply yarn. I didn't think it would be so pink, but I absolutely love it! It's just pretty and I plan to knit it up into a pair of socks. Another two storms are supposed to be rolling in tonight.....we shall see! Are you ready for fall weather? We are supposed to be under a flood watch in our region this weekend, with the usual fall storms and some wind forecasted. Where I live it would be next to impossible to flood (on top of a tall hill, with ravines all around) but it is definitely a concern for people in the low lying areas. We are prone to windstorms, and of course earthquakes. Naomi and I were talking last week about how we both like to be self-sufficient in cases of power outages and the like and it made me think I should go through and update the supplies that we keep on hand. It's fairly typical to have the power go out in our neighborhood. We basically live in the woods/surround by woods and so if someone sneezes too hard, our power just may go out! I thought it might be a good service to remind you all to see that you have enough supplies on hand to be able to take care of your own needs and even community needs if necessary in the case of something like the aftermath of a windstorm or earthquake or whatever disaster may happen in your area. My first inclination was just to post a quick link to the American Red Cross or Ready.gov, but my favorite resource from them apparently has been taken off line. I have a 6-month (24-week) calendar helping you to get ready for pretty much any type of disaster. I'm thinking I will post each week here until I've gone through all 24 weeks. It's yours to choose to follow or ignore. I just know that when we had our power out for 5 days because of a windstorm a few years ago, I was really happy that I was prepared! There is actual knitting content going on - I finished the back of the Tilia sweater and have cast on for the front. I hope to get the lace section done before heading off for the weekend so that I just have the stockinette section to work on in the car. I also have some giftie socks I'm working on (no picture) and am really liking short row heels now that I've figured them out.